Info 3 - 4 May '19 · Open Air · Denver, Colorado, United States Line Up: Shpongle Live in Concert plus very special guests. 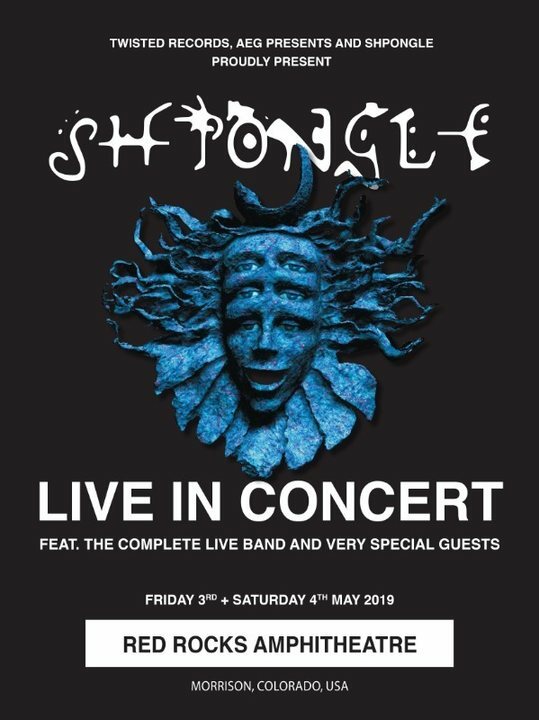 Shpongle Live in Concert plus very special guests. We are delighted to announce that five years after Shpongle's fabled Red Rocks performance, the band will return to this magical venue for their final concert. It’s been over 20 years since the inception of the world's most mystical musical phenomena, and after having shared their magic at concerts and performances across the globe to tens of thousands of fans, they will be making their last public appearance at this stunning location with an even bigger show that features the complete live band plus many more special guest musicians. Although this is their last full public concert, Shpongle will continue to enchant and delight with future studio recordings and album releases, with some Shpongle 7 productions receiving their world premieres at this performance. Join us for this once-in-a-lifetime experience as Shpongle make musical history and fly the Star Shpongled Banner one last time. If you have ever dreamed of witnessing the one-of-a-kind Shpongle live experience, then book your tickets now. There will be no further tours and no more international appearances. This is it: your invitation to join us at the one and only Shpongle Grand Finale Concert! in 0.611 seconds server time.